Source: Wikipedia, "Legacy of the Ancients", available under the CC-BY-SA License. 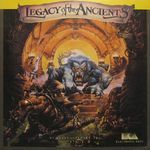 Legacy of the Ancients is a fantasy RPG computer game published by Electronic Arts in 1987. The player takes on the role of a young shepherd who finds and loots a recently dead body while on a first trip to the city, taking a black disk, a bracelet, and a leather scroll. The Galactic Museum mysteriously appears to the player after collecting these items. The player learns that by taking these items, he has become the next in a line of adventurers attempting to destroy the Wizard's Compendium, the leather scroll the player picked up. The museum has various display cases that require the insertion of special coins of various types to access. Some coins can be bought in random encounters with NPCs, some can be found as loot after combat, and some coins can only be found at the bottom level of various dungeons, meaning the player cannot proceed beyond a certain point until that dungeon is finished. Unlike many RPGs, the game does not use an experience point system. The player gains levels only through the successful completion of various quests. The game is mostly in top-down style for the world maps, towns, and castles, but switches to a 3D style in the dungeons and in the museum. Several different areas of the game, like games in towns and certain museum displays, allow the character to play in special mini-games, which, if done successfully, will permanently increase attributes. Also, various casinos about the towns let players gamble to win money. It is also possible to rob banks in cities, but this attracts the attention of the town guards, who will remember the robbery until the player enters another town. Full-color, scrolling 3-D mazes. The flickering shadows of torchlight on moldy walls. The blood dripping from a monster's teeth. The richest graphics you've ever seen in a role-playing game. The squish of swamp muck between you toes. Buzzing electric force fields. The echoing roar of your Kill Flash spell. You'll be amazed at the sounds your computer can make. You want a lot to do? Lots of choices? You've got it. A dangerous quest. A fast pace. Continents, oceans, wilderness, towns, dungeons, a castle and a fortress to explore. Puzzles. Gambling. Fighting. Magic. Everything you love about fantasy games--and lots of things you've never seen before.